Once upon a time, if you mentioned �Leamington,� those in the know thought �tomatoes.� After all, the Essex County town on Lake Erie�s north shore, has long been known as the �Tomato Capital of Canada� and is the site where H.J. Heinz Company established Canadian operations in 1909. The production factory, churning out a steady stream of sauces, canned goods, baby foods and, of course, ketchup, is still the community�s largest employer. Today, however, mention of the southwestern Ontario town evokes a new reputation � as a lifestyle utopia. In 2006, MoneySense Magazine picked Leamington as Canada�s best place to live among communities with populations over 10,000, outpacing large metropolitan centres and idyllic vacation spots like Whistler, B.C. The designation has captured the imagination of hundreds of home seekers across Canada and beyond, says economic development officer, Anne Miskovsky. �We continue to get calls.� It�s particularly attractive to empty nesters looking for the perfect setting for their retirement years, she says. Certainly the town has plenty of attributes, not the least being its weather. As the country�s southernmost point, on the same latitude as northern California and Tuscany, and with the moderating impact of the lake at its doorstep, the area enjoys long, warm summers and temperate winters. Snowfall is minimal and the severe, frigid winters that characterize most of the country are almost unheard of. �For the most part, you can put away your snow shovel,� Miskovsky says. The temperate climate and fertile soil make it a prime agricultural region, producing the most diverse range of crops in the country � such produce as apples, zucchini, cucumbers, peppers, a variety of flowers, and of course tomatoes are plentiful at roadside stands and farm markets. The area also has the largest concentration of greenhouses in North America � more than in all of the United States, Miskovsky says � with more than 1,000 �under cover� acres extending the growing season to eight months of the year. Another crop bringing recognition to the area is the grape. Vineyards abound and, while larger wineries like Colio Estates (this year celebrating a quarter century) and Pelee Island Winery have become well known outside the region, micro-wineries are springing up and winery tours are increasingly popular, Miskovsky says. Nature itself is a major area attraction. Point Pelee, one of the country�s smallest national parks, a triangular sand spit jutting into Lake Erie, is an ecologically sensitive remnant of a Carolinian ecosystem, with one of the largest fresh-water marshes left on the Great Lakes. A regular stopover for migrating birds and butterflies, it draws naturalists from around the world. Just offshore, accessible by ferry, spring through autumn, and by plane in winter, Pelee Island is the largest of an archipelago of nine islands that make up the Township of Pelee, characterized by the peaceful serenity of long beaches and wild natural areas. Miskovsky notes that plans to capitalize on this nature nirvana include the creation of walking trails along the lakeshore and branching inland to connect with regional trail systems. Touring around the community, a noticeable feature is how suburban areas meld seamlessly with fields, acres of greenhouses and beachfront, creating a pastoral flavour unusual in an urban environment. But Leamington has more to offer than Mother Nature. Recreational opportunities include golf � at several courses in close proximity � curling, tennis, skating and boating. 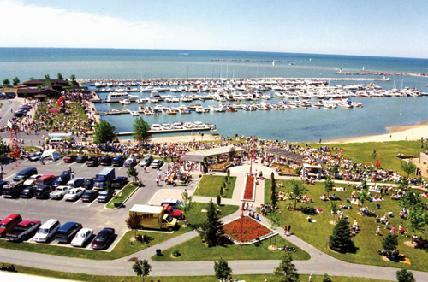 Leamington Municipal Marina attracts sailors from far and wide with space for more than 300 vessels, a picnic shelter, nautical-themed play area, waterfront promenade and a roster of special events and festivals throughout the summer. The Kinsmen Recreation Centre is a modern complex with an Olympic size pool, squash and racquetball courts, two ice surfaces, an indoor track, fitness studio and physiotherapy/rehabilitation clinic. A downtown Arts Centre, in an early 20th-century building, is home to theatre productions, an art galley and the Erie Quest Interpretive Centre, where visitors explore underwater treasures, including some 250 shipwrecks in Pelee Passage. The centre, says Miskovsky, is slated for a major expansion to create a 200-seat theatre, enlarge the art gallery and improve accessability. The town�s housing stock is growing with new construction of single homes, townhomes and apartments pushing municipal boundaries. As yet, there is no designated �adult lifestyle community,� but Miskovsky says there�s been talk, so it�s likely just a matter of time. Meanwhile, there are options for older adults, with some eight facilities providing accommodation from independent and assisted living to long-term care, including the new retirement apartments at Leamington Luxury Retirement Suites. And, Erie Glen Manor Retirement Residence received a National Quality Institute award for excellence in 2006. Leamington District Memorial Hospital is a progressive facility encompassing most specialties, and an integral part of a regional healthcare consortium that includes state-of-the-art treatment just a half hour away in Windsor. There�s a growing number of shops and larger retail outlets with some big box stores coming in, as well as a variety of eateries, many reflecting the diverse ethnic nature of the community, Miskovsky says. For additional information about Leamington and the surrounding area, check the Internet at leamington.ca or call the municipal offices at 519-326-5761.